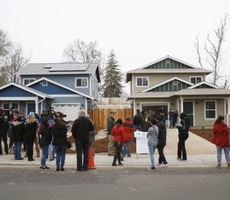 Blue Shield of California and its employees donated and volunteered to Habitat for Humanity which built two homes for families in Sacramento. The homes were completed and given to the families in a ceremony March 9. Elsabeth Wube is a single mother who supports her two young children and elderly mother who all live in an overcrowded rental. Elsabeth works three jobs. She is religious and she and her children pray together every night and for years her children have been praying to have a home of their own. Three years ago when Elsabeth was accepted into the Habitat program she decided to keep it a secret. All Habitat homeowners put in 500 hours of “sweat equity” building their home and other Habitat homes before purchasing their home for a 0% interest, 30-year mortgage. When doing her 500 hours of sweat equity on her days off from work, Elsabeth would wear her in-care assistant scrubs so her children would think she was going to work and then change into her construction clothes in the car. She plans to surprise her children on dedication day with the news that they now have the home they have been praying for all these years. The “Avenues Project” was made possible through the support of over 100 donors. Volunteers put in over 10,000 volunteer hours building the first two homes alongside the Wube and Ly Cha families. The final three homes of the Avenues project will be complete in September of 2019.